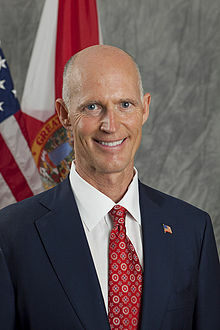 TALLAHASSEE, Florida -- Florida Governor Rick Scott Declared a State of Emergency today as Tropical Storm Erika approaches the South Florida coast bringing possible tornadoes, waterspouts, flooding, high winds, and heavy rain to the Sunshine State. In the Governor's Executive Order, Scott declared that, "Tropical Storm Erika poses a severe threat to the entire State of Florida and requires that timely precautions are taken to protect the communities, critical infrastructure, and general welfare of this State." The State of Emergency activates Florida's Emergency Management Plans, authorizes cooperation with the Federal Government, activates the Florida National Guard, and authorizes the waiver of tolls on Florida roads as may be needed. The Executive Order also provides for the suspension of Florida administrative actions, such as those in the Florida Department of Motor Vehicles, in the event those offices are closed to inclement weather. Pharmacists are also authorized to issue an additional 30 day refill of prescription maintenance medications.